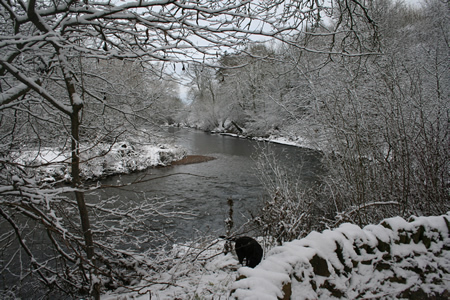 The early part of the winter – up to about five days ago – was mild and wet. These were probably good conditions for kelts to exit the river although very few of these fish survive to enter the river and spawn again. Not much research has been undertaken into kelt survival in Scotland compared with rivers in Canada where there are so many kelt that a strange sport called ‘black fishing’ takes place in April and May each year, when large numbers of local anglers fish for kelt- on a 100% catch & release basis. I was told on a visit to the Mirimachi in New Brunswick in 2011 that kelt survival in that river is as high as 30%. In Scotland we think survival rates are about 5%. I expect most of the South Esk’s kelts to be moving downstream, and spawning should now be over. 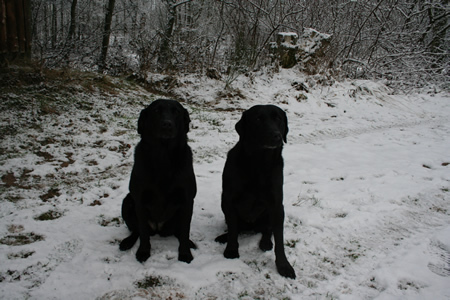 Our two labradors, Tally and Tinca, are finding salmon remains dispersed far and wide in trees and in fields along the river banks. As the weather warms up these corpses will smell worse and the dogs will be banished to their kennels after a good swim until the pong has subsided. It’s all part of our riverside experience as the winter draws into its last phase! Speaking with Colin Gibb at Inshewan last week we discussed the likelihood of the odd fish having entered the middle river following the warm and high water of the winter up to last week. We agreed that some fish have probably got upstream of Brechin, but not in great numbers. My guess is that any fish that are in the river will be downstream of Justinhaugh Bailey bridge, and well worth a cast in the first days of the new season after the 16th of April. 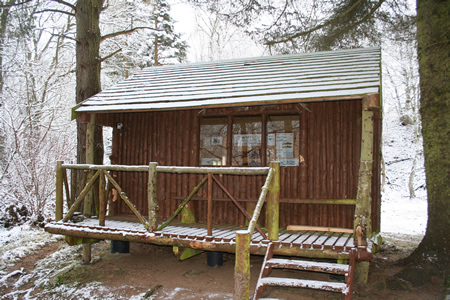 Red Brae Hut was built in 1993 and has witnessed many a celebration of fine catches of salmon and sea trout over its twenty years. Sea trout fishermen have kipped on camp beds, parties from Austria, Japan, Spain, France and England have enjoyed feasts and long lunches. The wine has flowed, the crack has been great and our family has many many happy memories. The ghosts of the Red Brae hut are all benign, and its walls await the next round of stories and accounts of great fish caught or lost. Apart from anticipation of the new season, there are some important issues for the South Esk. The second year of Marine Scotland’s radio tagging project should tell us more about where our spring salmon spawn and where juveniles grow into parr. Next week the Esk Board’s AGM takes place with elections and the prospect of a new chairman. The new season will reveal if sea trout numbers continue to recover and spring salmon stocks hold up . The river needs some better news and it would be good for its reputation if the Kinnaird beats and Cortachy & Downie Park have better catches of both salmon and sea trout than in 2012. It will be interesting to see how the Dee performs after the encouraging number of early salmon caught on the Tay this week. CLOSE CONTAINMENT SALMON – THE FUTURE? I know that regular visitors to this blog may feel that I should be writing about the South Esk. I promise you that I will return to South Esk matters, especially FCW of course, but during these short winter days and long nights I wanted you to know that I am not wasting my time! Besides which, your views and advocacy are invaluable, and I look forward to discussing this and other issues with you in one of the FCW huts during the coming season, which is one month away from today! Close Containment: the plot thickens. The speed of development of the Close Containment argument is encouraging. In August 2011 Professor Ken Whelan, AST Research Director, and I were in New Brunswick to discuss with our US & Canadian partner NGO, the Atlantic Salmon Federation, and the prospects for close containment farmed salmon grow-out – from ovum to market size adult. B) The technology is in place. The product has been independently tested and tasted. CC offers a biological firewall between farmed and wild salmonids, no pollution, fewer chemicals, no disease, no parasites, no waste, close to market minimising stress etc. c) There is a significant level of interest for ‘sustainably grown’ salmon from some retailers and many consumers. We left St Andrews NB having decided that AST will support development of CC salmon aquaculture, however long it may take to come to fruition. We acknowledge that, for the foreseeable future, currently in many cases ‘unsustainable’, marine-based systems will continue, but concluded that we now need alternative forms of salmon aquaculture so that decision-makers understand that open cages are not the only option in places where it can be shown that there is a high risk to migratory salmonids. 1. Undertake a risk analysis of all existing and potential saltwater farm sites on the Scottish west coast and in the islands. This is what MIAP is doing. 3. Develop alternatives (which is where CC salmon farms come into play) to sites which are shown as too high a risk to wild salmonids to be allowed to continue operating. AST and S&TA are taking this forward. 4. Ensure that protocols and good husbandry standards are met and independently verified and enforced in all remaining marine-based sites. ASFB and RAFTS are leading on wild fish interests’ response to the Aquaculture and Fisheries Bill. 5. Obtain political and industry support for a range of methods and technologies to ensure that the right sort of salmon farm is located in each risk-assessed site (i.e. minimising damage to wild stocks). We are all working together on this. 1. 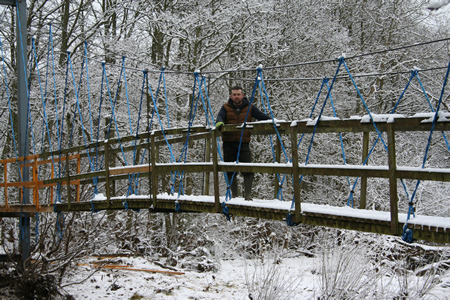 In December 2011 Andrew Robertson and a well known Norwegian salmon farmer were introduced to each other by AST. 2. In January 2012 AST held a private dinner at the Flyfishers’ Club in London for the newly formed company ‘FishFrom’ and members of the investment community. This was the springboard for all subsequent developments. 3. During the spring, summer, autumn of 2012, and continuing to now, AST provides regular back-up and support to FishFrom. Whilst being careful to ensure that AST does not transgress its charitable status by getting involved in a commercial venture, we have adhered to our ‘biological firewall’ principle in continuing to give moral support to FishFrom, whose operations are well described on its website. a) The technology and the product are ready and there is a growing number of companies in Europe, China and North America involved in development of the CC industry. c) The investment community is “not yet comfortable” with the business models currently on offer. e) In the context of destruction of many different species fish stocks there is a determination, well supported by considerable resources, to rollout CC technologies globally, not only for Atlantic Salmon. f) Finfish aquaculture is far more economically viable and environmentally sustainable than any of the land-based animal production industries. To become genuinely sustainable salmon aquaculture must clean up its act. Following the CC workshop Melfort and Tony were in New York in December 2012 for the ASF’s AGM where, yet again, we were impressed by the level of commitment and resources available to develop CC technologies and, as an interim, take on the existing salmon farming industry and persuade it to become environmentally sustainable. The issue remains that of commercial viability, and this is now being addressed on a daily basis from West Virginia to Shantou. Speaking of which, Ken Whelan visited Shantou, China in December 2012 to learn about development of alternatives to the current practice of feeding farmed salmon on little fish (anchovies) from South America. Quite apart from the 2000 years of Chinese experience of sustainable aquaculture, Ken saw for himself the level of sophistication and relatively low cost of Chinese built CC finfish systems, confirming our belief that commercial viability is within reach. By growing algae and sea weeds, combined with polychaetes (ragworms) infused with fish oils (but using only a small proportion of the wild little fish currently used by the industry) genuine, across-the-board sustainability for CC systems may be achievable. Meanwhile FishFrom has moved with astonishing speed having obtained political support for its CC systems at the highest level of the Scottish Government, identified four possible sites in Scotland and one in Wales, received serious enquiries from 5 countries, completed the business plan and received serious expressions of interest in their technology and know-how from China and the European and City of London investment communities. No-one is suggesting that CC aquaculture will become the norm overnight. It may take a decade to get open-cage fish farms away from high risk sites. But one thing is for certain, which is that CC systems are the future. What next? As soon as CC salmon comes onto the market I would like to see every salmon fisherman in the country, every member of his/her family, their friends, acquaintances and people they can persuade in the pub or wherever, to buy only CC salmon. It is up to us to make the demand. Combine that consumer pressure with the PR that Andrew Robertson and his industry colleagues will aim at politicians, the media, supermarkets and wholesalers, and the sea change we are all looking for may come sooner than we think. Posted in Uncategorized | Comments Off on CLOSE CONTAINMENT SALMON – THE FUTURE? I thought my readers would be interested to know about this visit in the context of the continuing problems of mixed stocks exploitation and salmon farming, although (thank goodness) only the first of these is relevant to the South Esk. While AST is a very small charity with 2.5 staff we feel that we have quite a lot of influence because of our reputation for science-based influencing and rational discussion. The issue of accidental damage to outgoing smolt migrations is of course highly relevant to the South Esk given the topography of the coast in the area of the river’s estuary. Last week the AST team were in Brussels to meet officials in DG Mare – the department responsible for European seas – and DG Environment – the department responsible for environment, habitats and biodiversity in the European Union. Melfort Campbell, AST Chairman, Professor Ken Whelan, Research Director, Ivor Llewelyn, Director England and Wales and Tony Andrews, Chief Executive, met a number of key officials, all of whom welcomed the Trust’s team, and actively engaged with our concerns. The meeting with the Fisheries Conservation and Control Unit, Atlantic and Outermost Regions of the DG Maritime Affairs and Fisheries, was a follow-up to Ken Whelan’s attendance in December 2012 at the meeting of pelagic commercial fishermen in Amsterdam (Pelagic RAC). At the Amsterdam meeting the Head of the Unit, Maria Candela-Castillo, had invited AST to meet members of the unit to discuss the issue of inadvertent by-catch of outgoing smolts by pelagic nets. It became clear during our discussion that DG Mare agree to be advocates for research into possible damage to outgoing smolt migrations as proposed by AST. Furthermore, Fuensanta Candela-Castillo expects AST attendance at the next pelagic RAC meeting to take the discussion forward. For AST this was a satisfactory outcome, and enables us to address an area of concern to biologists and fisheries managers. It also gives substance and momentum to our effort to address the by-catch issue. It is now a priority for AST to meet the Chairman of the Pelagic RAC, who is based in Scotland. Our second meeting with DG Mare was with Policy officers for Aquaculture Strategy, Common Fisheries Policy and Aquaculture. For AST this was really a briefing session for us to learn about the new EU Aquaculture Group which covers all aspects of aquaculture in both fresh and salt water. Anna Zito, the Aquaculture Policy Officer, explained that this massive new group will be unwieldy and too large to address specifics of salmon farming which, in the context of all forms of aquaculture, forms a small part. However, she explained that small subgroups will be established to deal with matters affecting each sub division of the sector, which should provide a focus for farmed salmon. We were also pleased to hear from Anna Zito that there will be full NGO participation in the main Aquaculture Advisory Group and in its sub groups. The meeting ended with a short discussion about the importance of the consumer in the development of salmon farming, especially as new technologies such as close containment options, come into production. The background to our meeting was SALSEA-Merge which had received funds of over £6 million from the EU and others. The discussion centred on biodiversity and conservation, with particular emphasis on the development of ‘safe migratory corridors’ for outgoing smolts. While it became clear that revisiting the designation of SACs in the hope of establishing new ones where there are perceived gaps at present, is unlikely to happen, it was encouraging to hear that there are other ways of protecting targeted species in the pelagic zone. We discussed the Marine Protected Area (MPA) approach and encouraging different methods of netting (e.g. lowering the front edge of trawls by 2 or 3 metres) to take the pressure off shoals of smolts. We felt that this was the start of a much longer discussion to focus on conserving and enhancing salmon and sea trout stocks with their full natural diversity. Like their DG Mare colleagues they agreed to be advocates for our approach to these issues. After a busy day in Brussels when the AST team met key officials in the Commission we left with the knowledge that our efforts are being followed and supported by officials who have a deep understanding of the issues affecting the survival of wild Atlantic salmon and sea trout. While it is unfortunate that sea trout are not officially part of Habitats directive designated species, we were greatly reassured by the willingness of officials in DG Mare and DG Environment to listen to our concerns, and we were left in no doubt that, as a recognised ‘expert’ NGO on two important migratory indicator species, we can return to Brussels with our concerns when we need to do so.